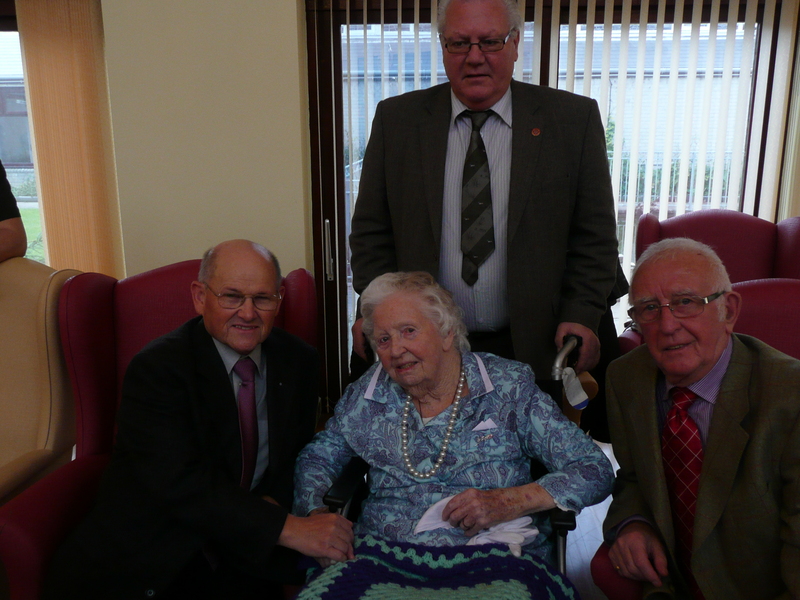 Mrs Rosalie Lewis celebrated her 100th Birthday on the 27th November 2013, at the Albert Edward Prince of Wales Court, Porthcawl. Her late husband Bro. Cliff Lewis was a member of Homfray Lodge No 1562 and graduated to the Grand Lodge above in 2001. They had been married for 65 years. Just over 3 years ago, W.Bro Selwyn Gardiner, a PM and Almoner of Homfray Lodge, succeeded in obtaining a place for Rosalie in the Porthcawl Care Home run by the RMBI. You may already know there are another 16 such facilities in England & Wales. W.Bro. Selwyn (pictured right), W.Bro. 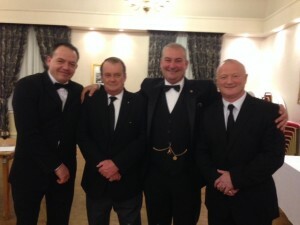 Henry Chivers (middle), IPM, and W.Bro. T. John Moses (left), attended her celebrations which started at 10.30am. Rosalie was surrounded by 4 generations of her family and it was a lovely morning. During the day many of her old friends and neighbours visited. The staff at the home are marvellous; they do care and are a credit to the RMBI. They arranged a wonderful spread and birthday cake. Children from the local primary & junior schools came and sang for her. A small group of sixth formers, from the local Comprehensive sang a few songs from their upcoming Xmas show, which was very professional – a credit to their teachers & school. They had lunch with Rosalie and although she relies on a wheelchair, her general health is good but her mind is razor sharp. She was a community nurse with Monmouthshire County Council for 46 years and kept them entertained over lunch, with the stories of her exploits in the Welsh Valleys, during her working life. Rosalie spoke of her gratitude to Freemasonry in general & the RMBI in particular, and of how moving to Porthcawl had been a life-changing moment for her. Rosalie said that Selwyn had made it all possible – she is now very happy. 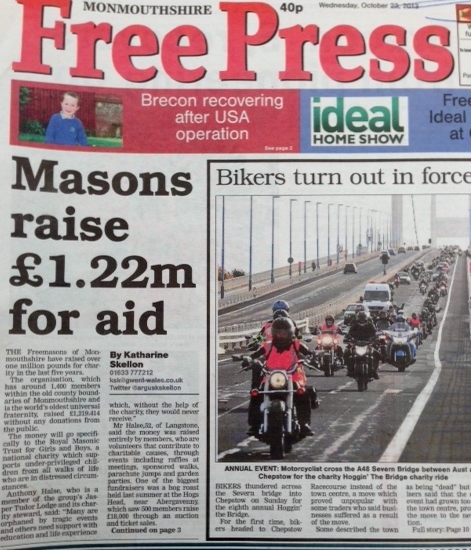 In the latest edition of “Freemasonry Today” page 67 – there is an article reporting on the 40th Anniversary of the opening of the home at Porthcawl and also the 100th birthday of Lina Joshua. The joint celebrations were held in September 2013. In fact, three residents celebrated their 100th in 2013 and Rosalie is the youngest of the trio. This article courtesy of W.Bro. T. John Moses. 50 years and still going strong! WBro. 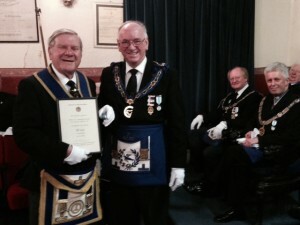 Oswald Lovering who has been a Freemason for just over 50 years received a certificate and a Veterans lapel badge at the St Mellonius Lodge meeting where he is the Senior Past Master having attained the Chair in 1973. When asked what he thought of reaching such a milestone he replied ‘firstly I’m glad I’ve lived this long’. WBro ‘Ozzy’ is the grand age of 85 and still enjoys an active participation in Lodge activities. Over 50 brethren attended the meeting which was very light hearted and enjoyable. Pictured with Ozzy (above) The RW Provincial Grand Master the Rev. Malcolm C. G. Lane and (below) The Assistant Provincial Grand Master WBro. Robert Arundel. An honour and a surprise! 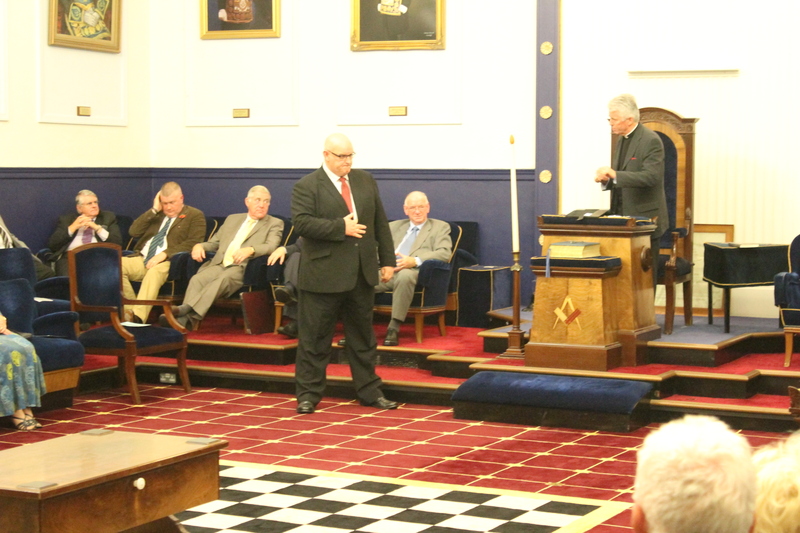 At the Silurian Installation the Worshipful Master proffered the gavel to the RW Provincial Grand Master as a token of courtesy only to be informed that he would be keeping it for a little while as he had Provincial business to perform. The Lodge Wardens were then replaced by the Provincial Wardens and the RW Provincial Grand Master then promoted WBro Vernon Edwards (pictured) to Past Provincial Junior Grand Warden in recognition of all his hard work as the Provincial Charity Steward. A promotion richly deserved considering the success of the Festival where over £1.2 million was raised over a five year period for the Royal Masonic Trust for Girls and Boys. Jasper Tudor Brethren reach 25 year milestone. 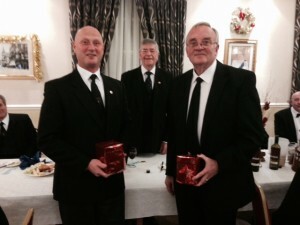 At the December meeting of the Jasper Tudor Lodge a presentation was made by WBro. John Challenger (background) to WBro. Jonathan Roberts (left) and Bro. 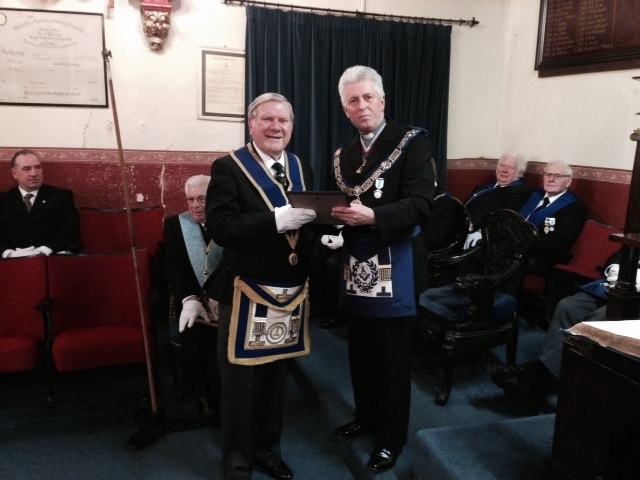 Mike Willis both celebrating 25 years in Freemasonry. They were co-initiates and have both enjoyed their membership of the Lodge and Freemasonry in general. 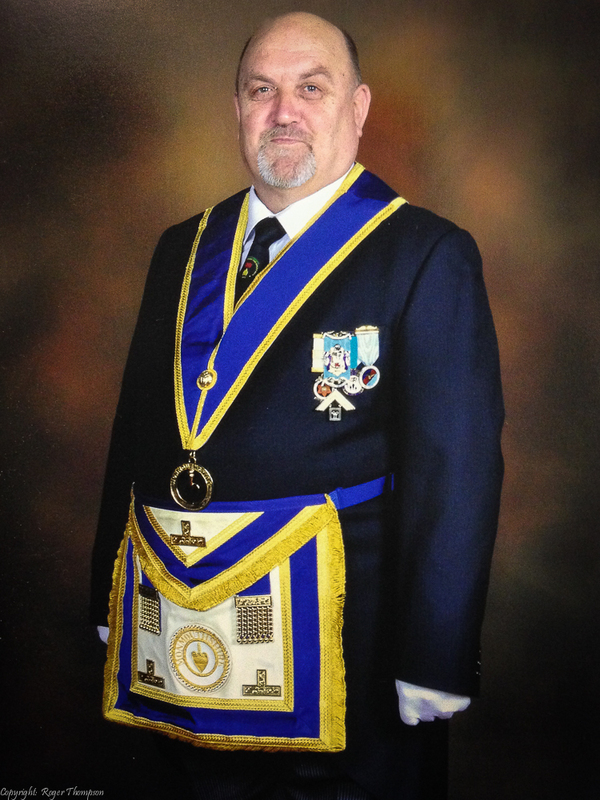 Although Mike has never taken the chair he has been a stalwart member and often travelled great distances to attend his Lodge as he has lived in several parts of the country. WBro. Jonathan is well known to us all as he is quite a prolific Mason and currently holds the rank of Provincial Director of Ceremonies in the Mark degree. The Lodge presented them with engraved tankards to celebrate this milestone and hopefully they will continue to enjoy their membership for many years to come. 2013 is coming to an end and 2014 will soon be upon us. The Province has enjoyed an extremely successful year with the consecration of the Armed Forces Lodge (albeit at the second attempt due to the inclement weather last January) and the culmination of the two charity appeals undertaken by the Province. The Festival period for the Royal Masonic Trust for Girls and Boys ended during the Summer, and the celebrations in September at the prestigious Celtic Manor were enjoyed by all who attended. The total announced that evening for the five years hard work by many Brethren of the Province was £1,219,414 a truly staggering amount and far exceeding our original target of £750,000. The Royal Arch Bicentennial Appeal for the Royal College of Surgeons was also completed with Monmouthshire exceeding our target by over 50%. Contributing to a national total of £2,000,000. I must take this opportunity to make mention of the retirement of VWBro Anthony Williams as Deputy Provincial Grand Master following years of outstanding commitment and dedication to the Province. We all wish VWBro Anthony a happy retirement to spend quality time with his wife Sylvia. On the retirement of VWBro Anthony I was pleased to appoint WBro Richard Davies as Deputy Provincial Grand Master at the Provincial Grand Lodge Meeting in October and I congratulate him and look forward to his support in the future. Monmouthshire as a Province is almost unique with only 30 Lodges, where deep and meaningful friendships are forged right across the Province by those who enjoy their visits to other Lodges, and on a personal note I thank you all for the welcome which I receive together with my Provincial team at every Lodge Installation . Freemasonry is a wonderful organisation, within our values are Brotherly love, relief and truth. The Festive season is a time where we need to exercise those ideals by sparing a little time for those who may be alone this Christmas. Perhaps a phone call or a visit will reassure those who may be feeling a little isolated that they are in our thoughts and are not forgotten. Christmas is a happy time and should be about enjoying yourselves with your families and friends. I hope you and your families have an enjoyable Christmas and a healthy and prosperous 2014. Islwyn Lodge raised a magnificent £507 at their Christmas Festival and the following Lodge raffle where there were a selection of wonderful cakes made by WBro. Les Evans daughter. The Christmas event was very entertaining when Santa had an identity crisis as there were two Santa’s in the building at the same time. The funds were presented to the Jacobstarz charity which is Blackwood based and dedicate their efforts relieving children and families who are affected by terminal cancer in young people. Pictured is WBro Kevin Hurley presenting the cheque to the chairperson of the charity Mrs Sara Eales, who lost her son to cancer. The RW Provincial Grand Master, the Rev. M.C.G. Lane was very pleased on behalf of the Province to hold the annual Christmas get together at Newport Masonic Hall for the benefit of many widows of Brethren of the Province. 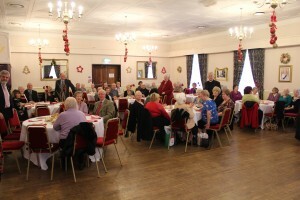 There were several Carols sung and a light buffet was served along with the traditional mince pies. This annual event is very important as it allows an opportunity for the renewing of friendships and generally reminds many that they are not forgotten and are still part of our fraternity. The Twelve Days of Christmas. All in all – a most enjoyable evening. WBro. Charles Ferris (pictured right) raised over £1000 by ‘sleeping rough’ for one night at the Cardiff International Sports Stadium. WBro. Charles is a wonderful example of a dedicated fundraiser and champion of good causes. Ranging from this event to his regular trips to Belarus taking much needed items to orphanages and other worthy groups. We wonder what his next ‘mission’ will be? This evening over £18,000 was donated to local charities and good causes. All the recipients were very pleased with the donations. Many were expecting much smaller sums than they actually received which was a very pleasant surprise for them. It was truly humbling to see the dedication and emotion from so many hard working people, all for the benefit of others. There were several touching moments ranging from two young girls (India Lane and Abbey Morgan) who gave a well rehearsed response on behalf of the 1st Bulwark Brownies, Sara Eales the chair of ‘Jacobs Starz’ a charity set up in memory of her son to Mr Ieuan Coombes a sufferer of cerebral palsy who walked through the temple to receive just over £500 for the Sparkle Appeal and many others who reminded us of how lucky we are….The Provincial Grand Master mentioned in his summing up how impressed he was with all those who do so much ‘for humanity’. 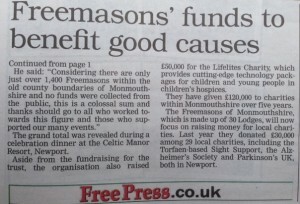 All funds donated were raised by Monmouthshire Masons. In addition £4000 was donated to the Wales Air Ambulance Service. 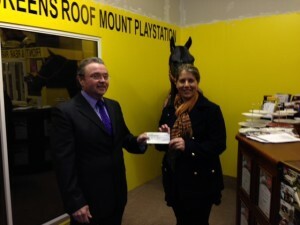 The funds for that donation was made available by the Grand Charity. Lewis Jones, son of Silurian Lodge Brother Emlyn Jones, has been raising money for the Lifelites Charity. Lewis, a Lewis, is currently ‘waiting in the wings’ to be initiated into the Silurian Lodge No.471. His fundraising efforts have been acknowledged by Lifelites and below is an extract from his Employer, SIEMENS Newsletter “CASCADE” which published the story in their November 2013 Issue. So far over £500 has been raised, but further donations are most welcome. Lewis would like to thank all those who have donated so far. His Father Emlyn said he and the Family were very proud of Lewis and the efforts he puts into charitable fundraising. Emlyn works in Dubai and plans are underway to coincide a trip home with an Initiation probably in April or May of 2014. W.Bro. Adrian Martin, Worshipful Master of the Silurian Lodge said he was delighted that Lewis is desirous of joining the Lodge and the whole Lodge will be looking forward to his Initiation. W.Bro. Adrian said that Charity plays a major role in the Silurian Lodge and that Lewis would fit in well with that ethic. 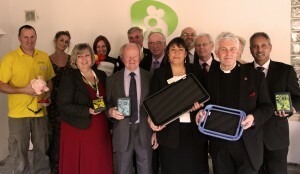 Press release from the recent Ty Hafan handover by Lifelites attended by the PGM, Deputy PGM, Asst. PGM and the Prov.G. Charity Steward and Elaine Edwards following the donation of £50,000 by Monmouthshire Freemasons. State-of the-art technology that works by the “Glint of an eye” has been donated to a local children’s hospice by award-winning charity Lifelites as they unveiled a trend-setting technology project at Tŷ Hafan children’s hospice. Lifelites projects provide specialist technology for the youngsters in all 49 of the baby and children’s hospice in the British Isles. The charity was announced Digital Leaders in 2012 in recognition of their innovative work with disabled children. The Tŷ Hafan children’s hospice project, which also contains state-of-the-art touchscreen technology, the latest gaming consoles and specially adapted iPads has been put together with disabled children in mind. And Lifelites say that this is where the Eye Gaze comes into its own: the incredible technology works by tracking the movement of the user’s eye, and it means that all children – whatever their disability or illness – will have access to the power of technology. The charity says that Lifelites equipment and support will cost around £35,700 over the next four years but Tŷ Hafan children’s hospice won’t have to pay a penny towards it. Instead, Lifelites has been supported by the Province of Monmouthshire and Thomas Cook Children’s Charity, amongst others. 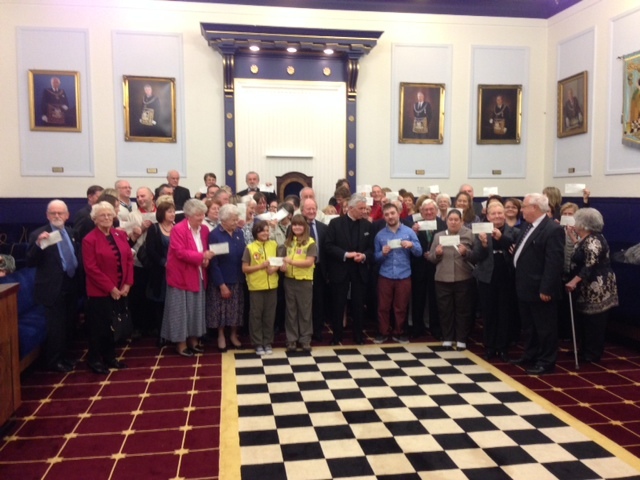 £1000 donation for Newport Masonic Hall restoration fund. During the after proceedings of a very successful Jasper Tudor LOI festival, WBro. Malcolm Beardmore is happily receiving a £1000 donation from Bro. Gary Gassor on behalf of the Brethren of the Jasper Tudor Lodge. 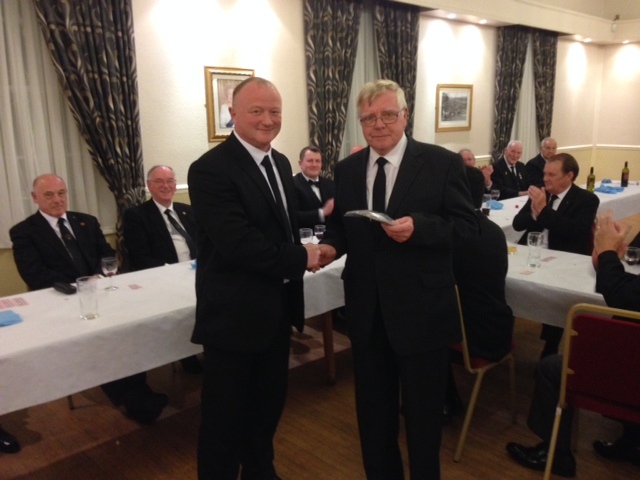 The funds were the proceeds of the ‘Demon Divas’ evening held at the end of October along with several donations including £100 from the Casnewydd Lodge. WBro. Malcolm emphasised the importance of donations such as this to enable the restoration of the building to be continued. A new account has been opened specifically for this purpose and all donations by either Lodges or individuals can now be designated solely for this very worthwhile project. As the representative of Newport Masonic Hall he also expressed his gratitude and hoped that other events would follow in order to make progress with the considerable work needed at present. Pictured below is Bro. Adam Heybyrne, WBro. Paul Salter, WBro. Anthony Halse and Bro. Gary Gassor. All of whom were integral to the success of the evening. On Saturday 26th October a social event titled the ‘Demon Divas’ was held at Newport Masonic Hall to raise funds for its restoration fund. Over 100 people attended and a wonderful show was put on by the Maindee Martial Arts group who also sponsored some of the expenses. Many of whom are members of the Jasper Tudor Lodge. 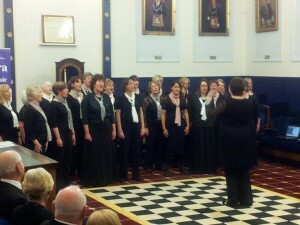 The event was also supported by other Lodges, either by attendance or by making donations. In particular the Casnewydd Lodge donated £100 towards this very worthwhile cause. The caterers put a wonderful buffet on at cost and made a donation along with others who could not attend. The raffle raised over £400 and along with a donation from the Jasper Tudor Lodge the amount raised was a tremendous £1000. The most noticeable aspect of the evening was how much everyone enjoyed themselves and highlights how fundraising can be fun whilst still keeping in mind the reasons for organising such events. 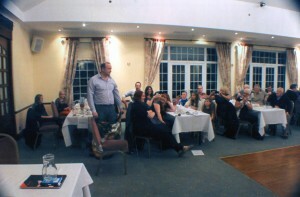 Roger the Hypnotist entrances his audience. 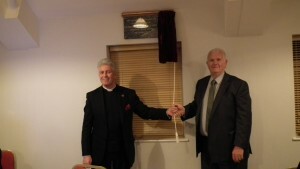 WBro Roger Mason of the Henllys Lodge held a hypnotic evening at the Greenmeadow Golf Club as part of the celebration of 50 years of the Llantarnam Lodge being in existence. 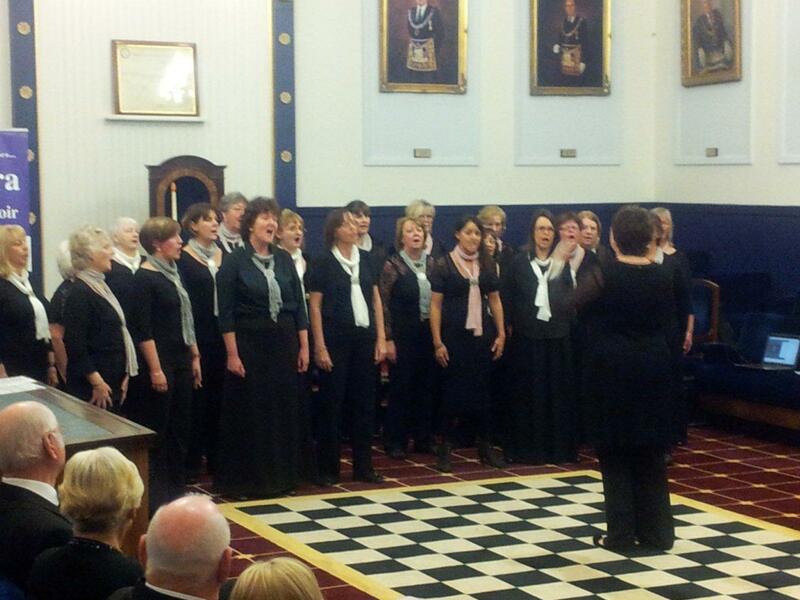 A wonderful night was enjoyed by all who attended and a considerable sum was raised for the Lodges charity fund. WBro Roger is a qualified hypnotist and has no trouble holding anyone’s attention, often for entertainment and at the expense of those who doubt his capabilities. Pictured is WBro Paul Carey (standing) on his way to the edge of sensibility under Rogers control. Congratulations to the Lodge and its members and those who took part in good spirit. 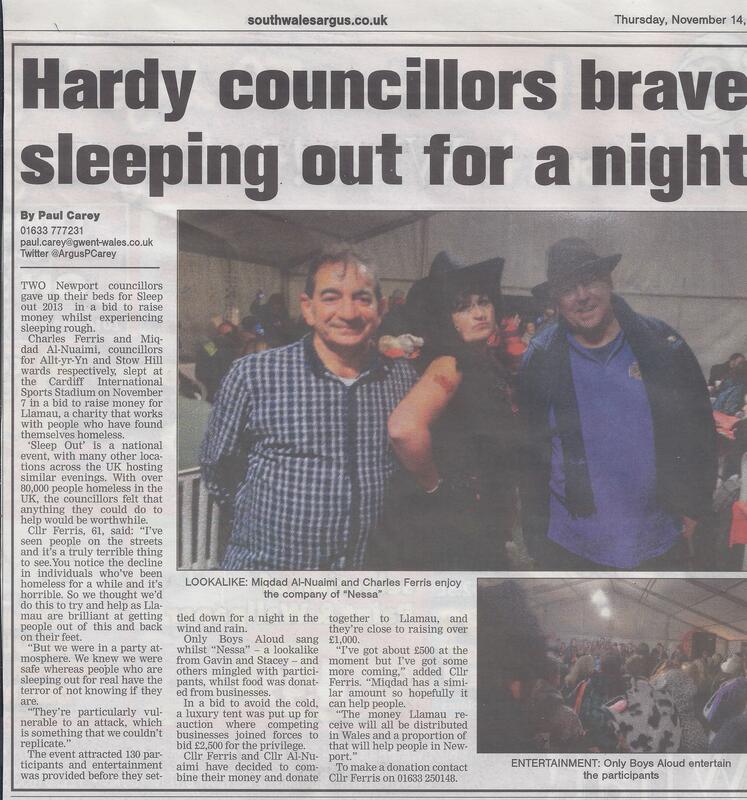 It is nice to see that our efforts have not gone unnoticed in the local press. Although no photographs were used, the prominence of the article is very good. Although, in the same paper there were photographs of ‘Alfie’ the Chepstow cat who passed away earlier this year!! Hopefully the general public will be impressed with our hard work and the results that followed whilst we were in ‘Festival’ for the RMTGB. On Saturday 19th of October Abergavenny Masonic Hall saw the culmination of 3 years of planning and hard work when they officially opened their new dining centre at No 1 St John’s Lane, Present at this important event was the Provincial Grand Master R W Bro the Rev’d. Malcolm C G Lane J.P. who dedicated the Centre and unveiled a plaque to commemorate the event. Also in attendance was the Provincial Grand Master of the Mark Degree R W Bro Derek Thomas along with many members and Wives of the several Orders that use the centre. All who attended enjoyed a fabulous meal and an evening that will be long remembered by Abergavenny Masons for many years to come. The Picture shows The Provincial Grand Master with W Bro Howard Caine Immediately after the unveiling. Last evening a meeting was held at Newport Masonic Hall for all recent initiates into Freemasonry within Monmouthshire. Almost 100 people attended. Many were new members with their partners and of course many of the executive were there to introduce themselves and to chat informally to the Brethren and their partners. 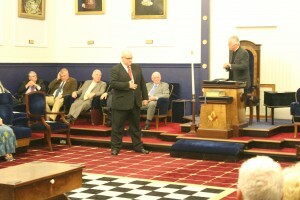 A very enlightening talk was presented by WBro. David Powell who delivered it is his own inimitable way. I am sure those who attended were very impressed and left the building with considerably more knowledge than they previously had. 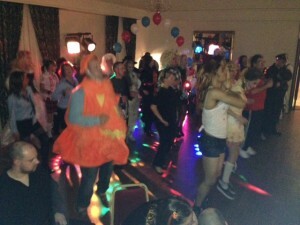 It was good to see so many people enjoying themselves. 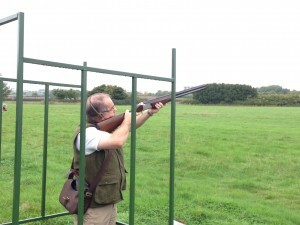 Monmouthshire Shooting Group the ‘Strongest Team’. Congratulations to WBro. 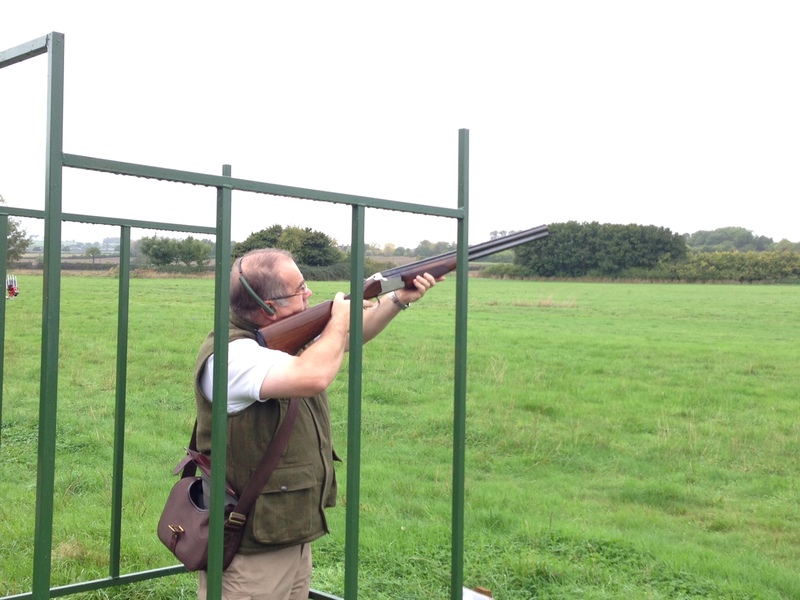 Martin Price and his group of fellow shooters for attending a clay shoot at Podimore Somerset. They were made very welcome and thoroughly enjoyed themselves. Unfortunately they came fourth out of four teams so they did prop up all the other teams, hence the ‘strongest team’. A great day out was had by all and without doubt there will be other events held within Monmouthshire and visits to surrounding Provinces. The group are currently looking for members so if you are interested please let me know. Today at the Supreme Grand Chapter meeting in London, the Most Excellent First Grand Principal the Duke of Kent announced the total of the Bicentennial Appeal for the Royal College of Surgeons. 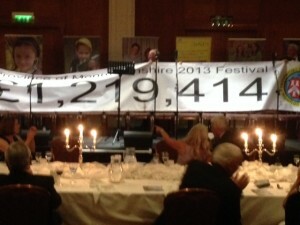 The total is a staggering £2 million. This amount is double the original target, and far exceeded everyone’s expectations. Monmouthshire Royal Arch Companions can be pleased with our efforts as we raised over £12,000 towards this total. No mean feat considering we were in Festival for the RMTGB at the same time. Research is crucial, and modern techniques are changing all the time to benefit those who are unfortunate enough to require surgery. Lets hope our funds will make a difference and help those who need it most. Bro Roy is 63 years old and a resident of South Wales and is a Past Provincial Grand Standard Bearer in the Province of Monmouthshire. He joined the Internet lodge in March 2008 and has attended lodge meetings and gatherings in England, Europe and the USA on many occasions. He has been the life and soul of many of our social gatherings as ring leader of a group of his Welsh colleagues who truly know how to work hard in Masonic toil and to play hard in Masonic refreshment. During his term of office the lodge will hold meetings in Manchester, Olney and Newport and a wonderful year is in prospect. We look forward to all of it except perhaps his singing. The annual gathering of the 2004/5 Masters was again held at the Parc Golf Club Newport on the 5th October. The meal was excellent and the company just as good. 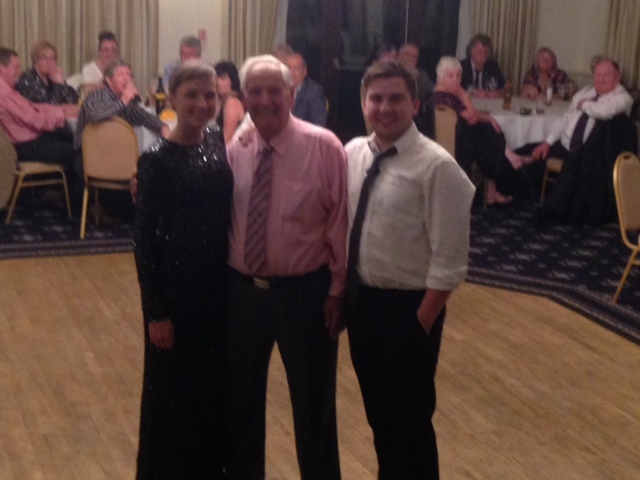 Everyone was extremely pleased with the calibre of the entertainment, Rhys and Rhianna Herridge are brother and sister and no doubt are destined for great things. Rhianna has one of the purest voices I have ever heard. With Allan reaching the grand age of 80 that week it was quite entertaining to hear Happy Birthday sung in Welsh. Quite a challenge for some (including me). 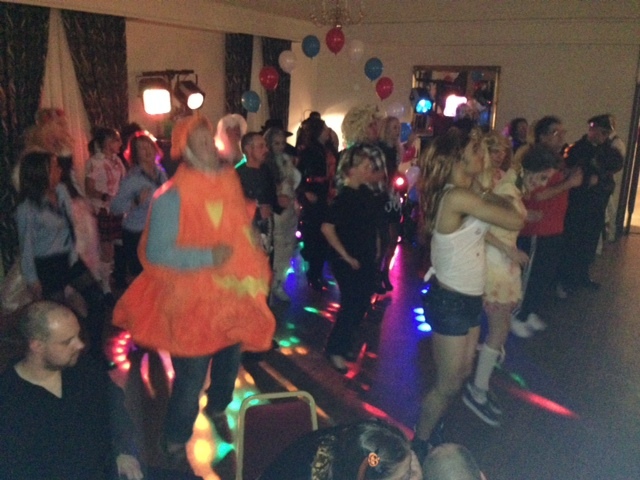 A raffle was held in support of the Sparkle appeal and £100 will be given to them in due course. The 27th September, 2013 will always be a date when I have been proud to be your Provincial Grand Master and Festival President for our Charity Appeal for the Royal Masonic Trust for Girls & Boys. The presence of the Pro Grand Master, MW Brother Peter Lowndes, the President of the Trust VW Brother Michael Woodcock , so many fellow Trustees and guests including the Member of Parliament for Monmouth David Davies was a great honour and tribute to the Province of Monmouthshire. The presence and support of over 400 hundred members of the Province and their Ladies made the evening an even greater delight when the Chief Executive of the Trust, Worshipful Brother Les Hutchinson announced the result of our Fund Raising efforts over the last five years as a staggering £1,219,414.00. In addition by your very generosity it was possible to make a donation £50,000.00 to the Lifelites The Children’s Hospice Charity. A very appropriate charity to compliment the Royal Masonic Trust for Girls & Boys. My very sincere and grateful thanks to you all for your sterling efforts and particularly to the 2013 Festival Committee under the Chairmanship of the Assistant Provincial Grand Master, Worshipful Brother Robert Arundel ably supported by the Provincial Grand Charity Steward, Worshipful Brother Vernon Edwards. The contributions of the membership of the Province by Gift Aid and fundraising activities have been greatly appreciated. I extend my grateful thanks to you all. Welcome to the new Blog, please check back regularly for updates. Also feel free to submit articles that you may deem newsworthy to others by contacting WBro. Anthony Halse the Provincial Communications Officer.